2017 was a great year for Rebate Bus. We accelerated our mission of simplifying the utility rebate experience for our partners. Utilities across North America want to drive the adoption of energy efficient technologies and we are focused on making the process easy and intuitive.We were blessed by great feedback from the market this year and have developed many new product features including a new zip code search and utility map feature on our Rebate Finder! We view our customers as our own business partners and seek to help them build their business with access to the most comprehensive source of utility rebate data. We do that by offering access to our API, with dedicated service from our team and by developing new software for our partner’s websites that engage their customers. In everything we do we are always focused on creating an easy and intuitive experience. Rebate Bus was also selected for the Ameren Accelerator, the first-ever business incubator started by an investor-owned utility; Ameren Energy Corp. Our entire team moved to St. Louis for three months and we now have a dedicated team in St. Louis and have been hiring locally. We worked closely with our customers throughout the year and had a number of new product releases. 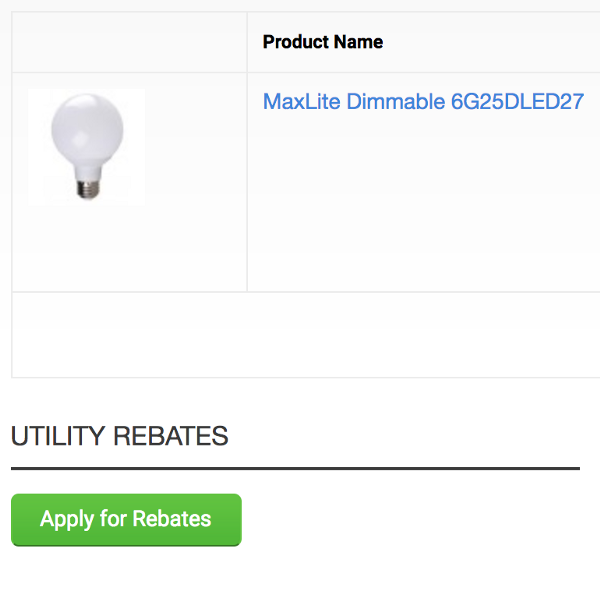 MaxLite launched their newly designed rebate finder. We also launched a new incentive finder for our partner here in Wisconsin, Focus on Energy. And, throughout the year we supported many customers with our new Rebate Bus Pro service. As our network of partner utilities, contractors, distributors, and vendors grows we continue to iterate and evolve our platform to be able to manage and facilitate instant rebate transactions everywhere across the country. Below is a series of milestones achieved throughout 2017 that played a pivotal role in the growth of Rebate Bus. Screenshot of our Data and Support Team using the Rebate Finder tool to fulfill utility rebate applications. The year began with a big push from the Rebate Bus team to quickly aggregate the release of new rebate program data across North America. With every program analyzed and added to our database, our platform grew smarter. Effective communication between our data and software teams helped develop much simpler tools used to verify specific categories of rebate applications. The aggregated and analyzed data on our platform went to work the rest of the year to help serve an array of business support teams applying for utility rebates. This included the Rebate Bus support team, which benefitted from its own data, fulfilling utility rebate applications for scores of equipment upgrade projects. By the end of the year, the data and support team had put together more data for the platform and fulfilled more utility rebate applications than any year prior. Lightfair 2017 could not have come at a better time for Rebate Bus. By May 2017 our team had collectively aggregated data for commercial lighting rebate programs offered from utilities across North America. Having developed our platform to deliver the common data used in a lighting rebate application (product requirements such as lumens, watts, operating hours, etc.) Rebate Bus proceeded to deliver great data to the lighting industry. Rebate Bus learned a lot from Lightfair and the experience provided our team with a valuable opportunity to develop many new relationships within the industry. 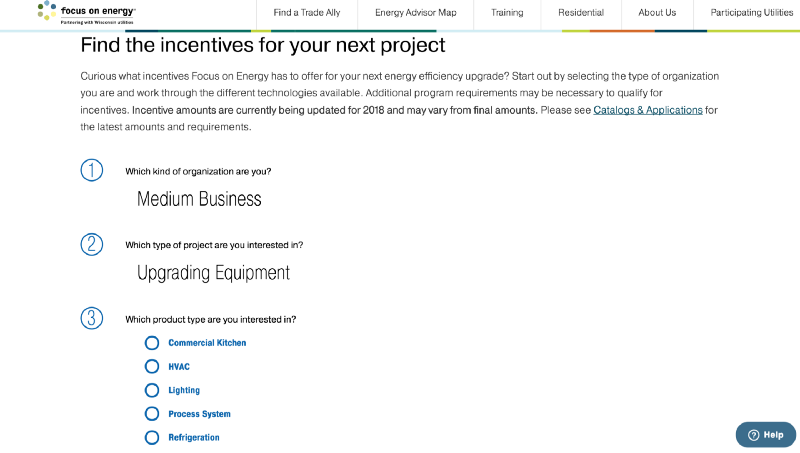 Screenshot from Focus on Energy’s custom web widget, a digitalized navigation tool for qualified equipment incentives. Much of the focus at Rebate Bus has gone towards growing our platform to primarily accommodate utility programs for LED lighting upgrades. However, with the help of our growing data support team, we expanded our coverage to deliver rebates on other energy-efficient products in 2017. Our expansion began locally with our team’s proposal to Focus on Energy in Wisconsin. Our proposal was to completely digitize their traditional catalogs that showcase available utility rebate programs. As a result, our team added six new application categories including commercial kitchen equipment, process systems, agriculture, refrigeration, HVAC, and plumbing systems. Once every program requirement was aggregated and digitally defined we worked on simplifying the customer’s experience. Now within just a series of clicks, customers are able to find incentive offers for any product. Screenshot taken from GP Conservation’s shopping cart, where customers can apply for rebates from utilities at the point-of-sale. Relationships made with utility program implementers have given Rebate Bus an in-depth understanding of verifying eligible program participants. From these relationships, Rebate Bus has been able to establish itself as the intermediary bringing together utility programs and the sale of energy-efficient products. Therefore in 2017, Rebate Bus released its instant rebate experience for the e-commerce setting. Introducing a plugin software tool made for e-commerce vendors. Since every online store operates using their very own e-commerce software, Rebate Bus began by developing a plugin fit for the many vendors using Magento. 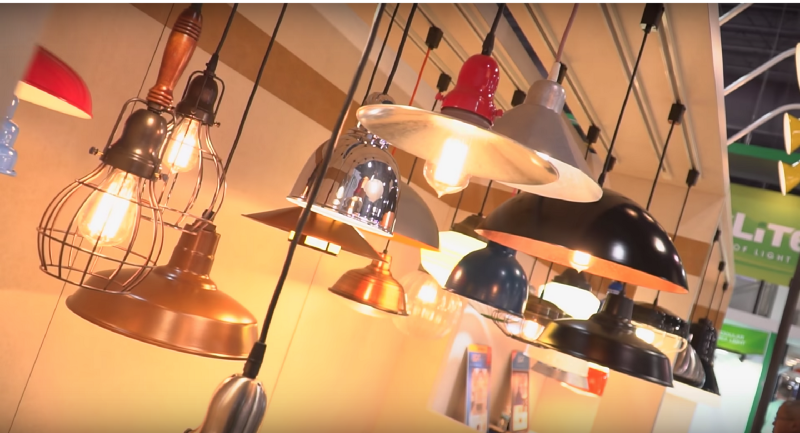 By September, Rebate Bus had launched its first live instant rebate tool for a lighting e-commerce vendor. The plugin works for both residential and commercial programs and is highly flexible based on the utility’s customer verification needs. 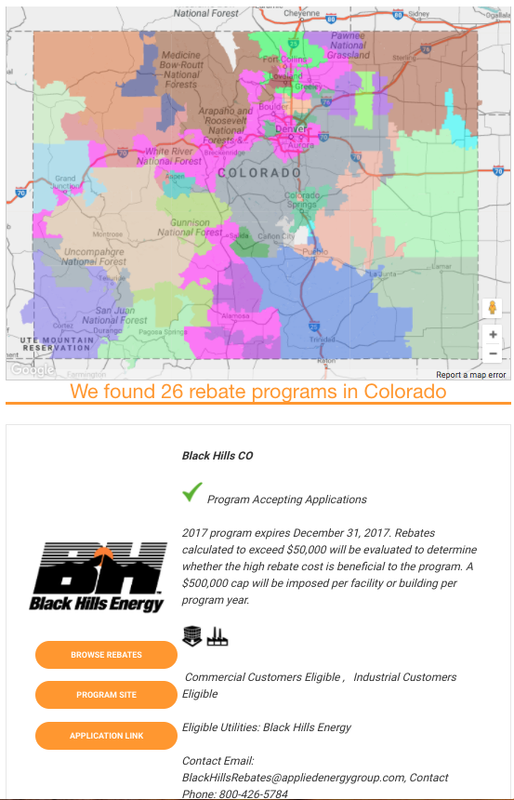 This achievement acted as a model example for how Rebate Bus brings utility programs and vendors together to deliver instant utility rebates. As a result, other vendors have signed on for our services and more are becoming interested in utilizing our software tools to deliver instant rebates. 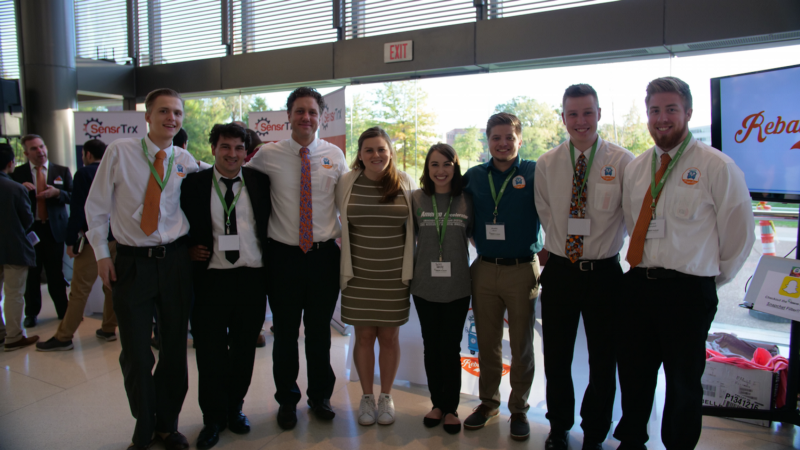 Photo taken at the Ameren Accelerator’s Demo Day at the end of October 2017. Rebate Bus caught its biggest break yet this past summer when our company got selected to participate in Ameren Energy Corp’s first ever Ameren Accelerator Program, powered by UMSL Accelerate and Capital Innovators. The program consisted of seven energy-focused startups leading innovation in things like grid management, smart-home devices, and blockchain energy transfers. The program was an incredibly valuable experience that helped grow the company’s reputation, business intelligence, and the team itself. There are many more things we accomplished in 2017 and all of it would not have been possible without our amazing team. We hire smart, creative people who want to develop next-generation solutions for the problems facing our planet. We are working hard together and really believe our efforts should be focused on making a difference. Contact us at team@rebatebus.com anytime to learn more. Exported from Medium on January 3, 2018.